On paper, I loved it. They looked like perfect little totoros holding umbrellas. After knitting body and sleeves up to the yoke and seeing that the variegated yarn wasn't working at all, I decided I hated it. As a last ditch effort, I switched yarns and decided it would be okay. I tolerated it until halfway through the yoke. No amount of ironing could make this look right. It looked like R2D2s or Daleks- hated it again. I was in too deep to quit, so I changed the chart again, feeling blech about the whole thing up until the moment I bound off and steam blocked it a final time. Today I put it on and loved it again. Fickleness, thy name is knitter. 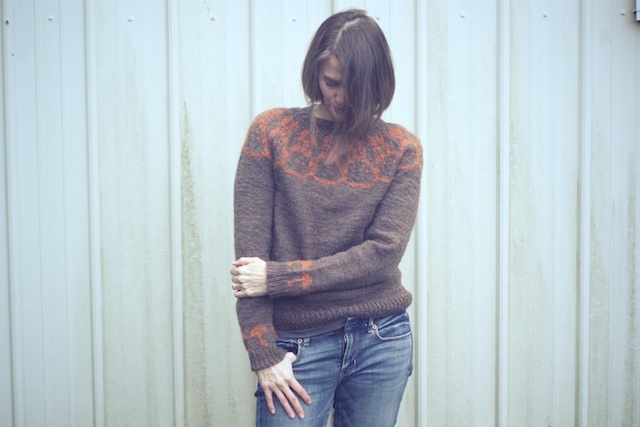 The actual pattern, Eliazabeth Zimmerman's classic Seamless Yoke Percentage Sweater, was awesome. But getting the yoke charted, ripping back to change yarns, then compensating for a gauge change at the end, kind of kicked me. Honestly, I'd never have done a totoro yoke if I'd known I couldn't use my yarn inspired by My Neighbor Totoro (above) for this. I like the orange and brown together, but I'd rather have a different color work pattern. I'd originally thought the variegated yarn might give a similar effect in the foreground as the Noro yarn did in my Selbu Modern. But it was just too variegated and too close in shade to the brown to clearly depict anything. What was I thinking? So, I switched to some persimmon Andes del Campo I had in my stash. I felt a need to get this knit finished, so I didn't want to try and chart out another pattern to fit within the allotted stitch count. I considered trying the yoke from The Killing sweater, but my stitch count was off and I was kind of "over" this sweater at that point. I also realized that, due to knitting fair isle, my row count was less than it should be, so I needed to make my decreases sooner. My solution was to re-chart the top half of my yoke (ripping back a third and fourth time), making my decreases sooner and omitting the umbrellas to have a clearer image of a totoro, while allowing my neckline to be lower. Too bad I'd already added umbrellas to the cuffs when I did this. Now, that makes no sense... sheesh. It's amazing what a quick steam block can do. I really like the orange and brown combo, I just don't prefer it as totoros. If I'd known I would be leaving out the umbrellas, I might have used this very large, clear chart. Oh well, it's done and now I have a very autumn colored sweater people can see me in and say, "Are those bunnies or owls?" and "Why are there umbrellas at the cuffs?" I can live with that. My thoughts about Elizabeth Zimmerman's recipe: It's fantastic and empowering! I feel confident that I could knit one of these to perfectly fit every member of my family if I wanted to. (I don't want to.) My sweater's fit turned out to be exactly what I wanted. If I hadn't done color work, this would have flown off the needles. The one thing I didn't enjoy about this design was the whole bottom up thing. I find the gaps where the armpits are Kitchenered together to be more difficult to hide than with top-down. But that may just be me. It's been a long time since I knit that style of pattern. 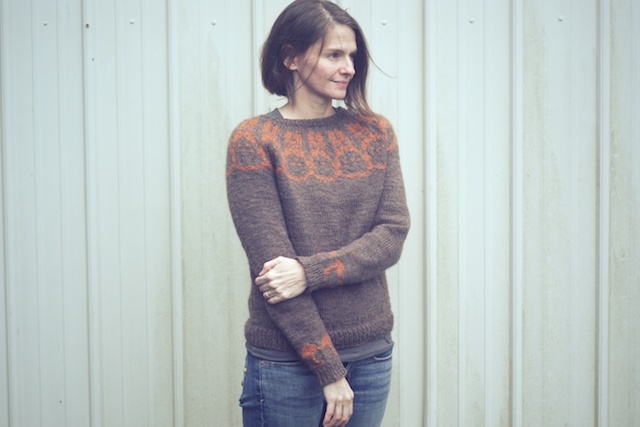 This percentage system sweater is in Elizabeth's book Knitting Without Tears. Now that I've tried at least one design in it, I feel like I can continue reading it to the end. It's about time, too, because the Canary Knits' Knitting Book Read-a-Long is about to move on to a new book. About the fit: Keep in mind that I wanted 3 or 4 inches of positive ease. I needed comfort. When I put it on this afternoon to take quick FO photos, I realized just how comfortable it was: straight bodied, a bit oversized, grazing the top of my jeans, and not itchy at all to me. I may be wearing it more than I first thought. The pattern is so customizable, though, that you could easily make a more fitted version and/or add waist shaping. I used size 3 wooden circulars to get gauge, though once I started the fair isle, it enlarged my gauge some. 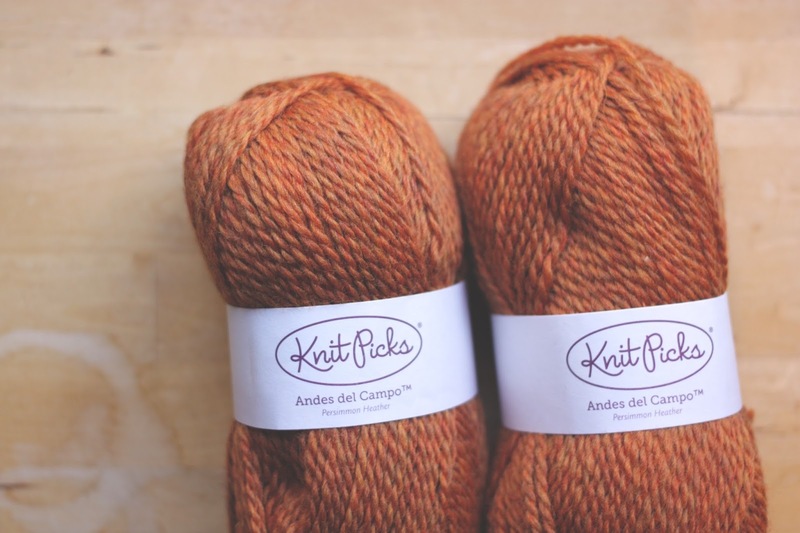 My wool was Wool of the Andes in Briar Heather and, eventually, Andes del Campo in persimmon. I cast on 162 stitches for a 37" size, then added 4 stitches evenly after finishing the ribbing. I knit the body straight, holding 13 stitches for each armpit. I started sleeves with the proper 34 stitches, but ended up ripping them back from the cast on edge to omit 3 decreases. So in the future, I would cast on 40 stitches and omit the first three decreases. When I joined body and sleeves, with reserve stitches for under arms on yarn holders, I had 226 stitches. I decreased one stitch at a shoulder, as I worked the first inch straight, so that I'd have 225 for my chart to work out. 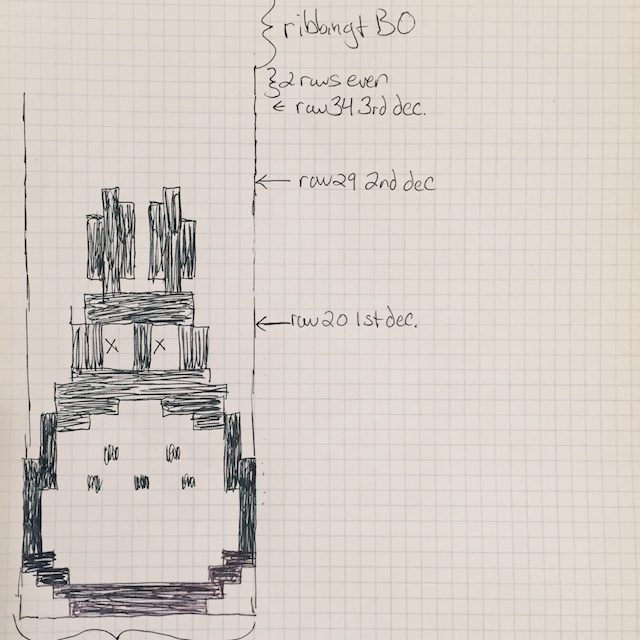 For the fair isle yoke: I followed my own chart for ten 15 stitch repeats. I decreases the first time at row 20, the second at row 29, and the third time at row 34 (sooner than recommended). 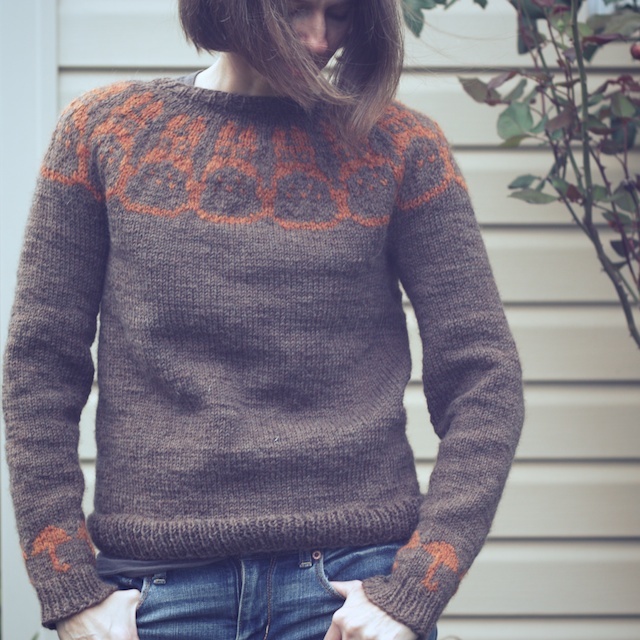 I did this because my row gauge was longer than my swatch on the fair isle, and I wanted a lower neckline. It worked out fine. I finished off with 5 rows of 1x1 rib and bound off. So, if you haven't seen My Neighbor Totoro, you should. It holds a special place in my heart as I first saw it with a friend when I was 17, then shared it with my children when they were little. It's something I don't have to have a child present to watch. As for my poor, bedraggled Totoro 2 yarn, it will soon be a giant pom pom hat, receiving all of the attention it missed while hiding in my stash. I almost ripped back my cuffs again to get rid of the umbrellas. My husband says I should keep them. What do you think, should I keep them for an odd folky feel or nix them? I LOVE THIS! so great. your fickle decisions paid off! Bravo on not giving up! It was very interesting to read about all you tried and how you found solutions to your problems. I really like the result as well, and I am sure you will treasure it even more because you know how much work went into it. It turned out beautifully! I love the umbrellas around the wrists. Perfect. I love Zimmerman's recipe for sweaters too. 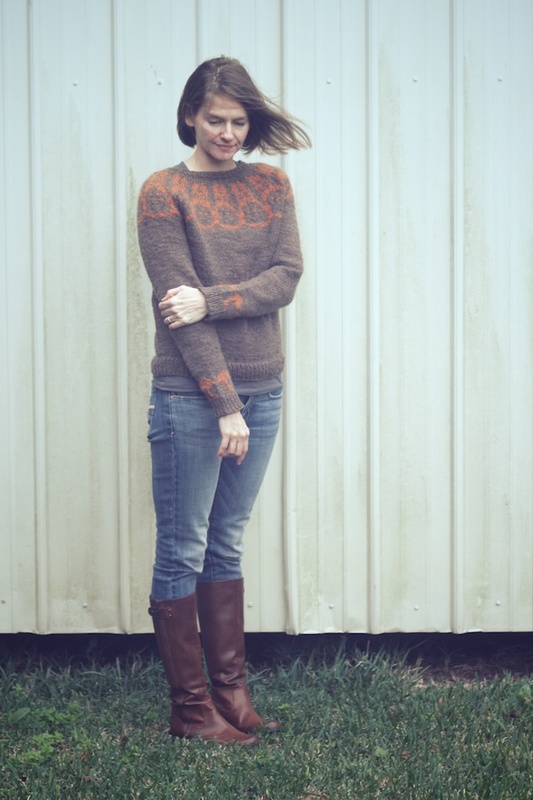 I couldn't believe how easy it was to make a great fitting sweater the first time I tried it. I really like the umbrellas! This sweater is very inspiring! I'm sorry to hear this didn't work out as you wanted it, but on the plus side, this really did turn out to be a beautiful sweater. I love the Fall colours and actually adore the little umbrellas on the sleeves! I think you should definitely keep those beautiful umbrellas. We know totoro carried the umbrella, and since yours don't, having them on your wrists is a nice touch. I personally love them but you should be happy yourself with it. I am sorry that your first choice of yarn didn't work properly but that orange on the brown background is such a lovely combination. I also think that bottom up sweaters leave a bigger gap to be closed at the end. Somehow in none of the cases I have perfect results. What I'm enjoying lately is Andi Satterlund's designs. The sleeves are picked from the edges and it looks like a regular sleeve. Also, no gaps to close. 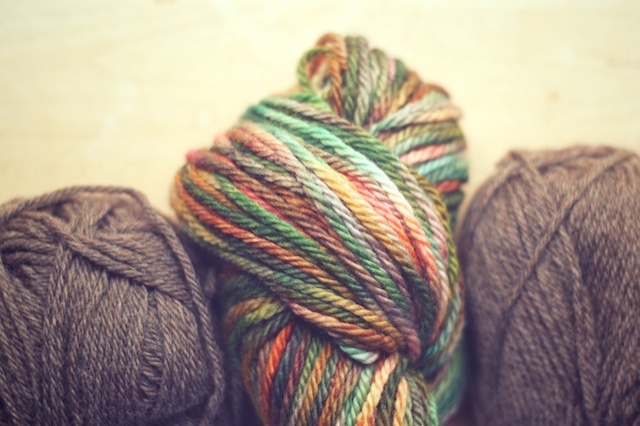 She has even released a guide on how to knit your own sweater following this principle. I'd keep them, but I'm lazy. I'm sorry you had so much trouble with this! It looks great, though. I like the umbrellas! If you ripped them out, what would you put there instead? One of the smaller totoros? 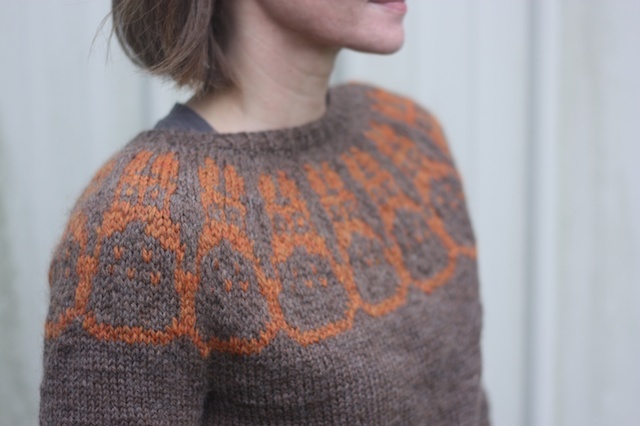 I love that the cuffs don't "match" the yoke, but they still go with the totoro idea. I LOVE this sweater and the way it looks on you. Just perfect, and even if you don't see the perfection in it every minute, at least its done and off the needles. Thank you, Kelley! I've worn it constantly since I made it. It's the fit, it's so comfortable. Thank you, Corrine! 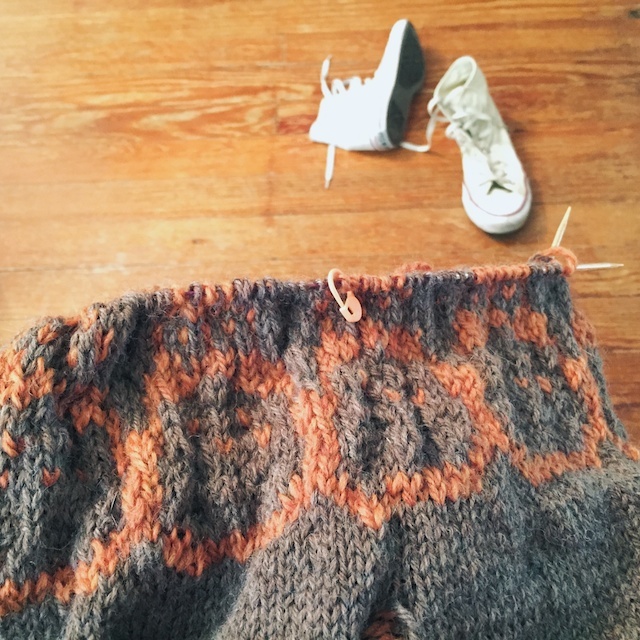 I do get sentimental over things I make that are challenging- like my first color work sweater, first socks, etc. This is one of those firsts, so, yes, I think I will treasure the experience. Thanks, Jennifer! Which of her recipes did you try? I really like the saddle shoulder or hybrid saddle shoulder designs. I think they'd make an awesome man's sweater. Thank you, Teresa! It wouldn't have happened without the Knitting Book Read-a-Long. I think I'll finish up Knitting Without Tears tonight so I can start Little Red asap. I definitely feel like my knitting skills bumped up a level with this project. Thank you! I love afterthought - type sleeves, Elena! Those, and top down, I feel confident I can close any gaps in. I have made one of Andi's designs and found the sleeve construction very easy to get a perfect result. For this project I did the recipe as directed, but next time I can just alter it to be top-down, using the same percentages. Ha! It's past the two day grace period, now, Sara. So, those umbrellas are permanent. Well, I don't think I could fit a clear totoro or dust bunny in so small a stitch space. I just decided to keep it as-is. It's grown on me and no one else will have anything like it, right? Amen! I felt really good about trying an EZ sweater with my own color work chart. That was the accomplishment. The fact that it fits well is a bonus. 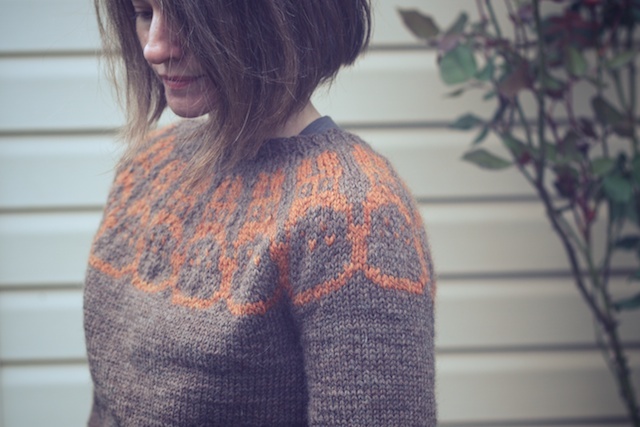 I've only done a raglan yoke, which I like quite a lot. The hybrid saddle would indeed make an awesome men's sweater. Oh I lied. I did whatever the seamless yoke is. I like that one too.